and they were very cooked. I was kinda worried they would be mush, at least the little ones. They were very soft. 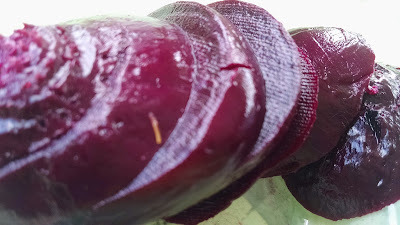 Peeling beets in the past has been a chore. These were easy! I kinda followed the directions I found here. For some reason all the directions I found said I was supposed to line the baking dish with foil or bake them individually wrapped in foil. That's more work and foil than I am expending. I just put them in the dish. When they came out, they had indeed stained the glass casserole dark burgundy. I figured I'd put that problem off for a while by ignoring it, so the beets went into the fridge. The next day I decided to take a teensy step toward responsibility and try to peel a beet. Surprise! When I pulled the casserole out, all the stain was gone from the sides and there was a thin layer of beet juice in the bottom! Yeah! The directions said to peel them under running water and they wouldn't stain my hands, much. It worked! Turns out I didn't really even need the running water! 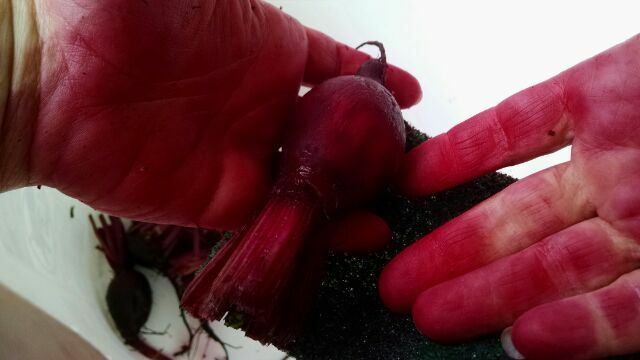 Cold, cooked beets with their tops and roots still on don't make much mess!!! The skins slid right off, and even the stems and roots came off without a knife! Remember this mess? No more! Now the flavor - beety. My kids were more creative. They salted and peppered theirs. They went back for more, so I tried the salt and pepper thing. Wow. That. Is. Good. 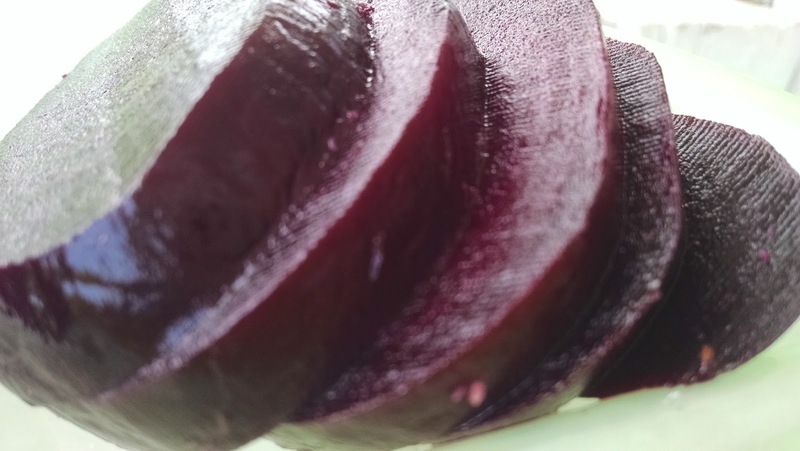 Love beets and have found that cooking them a long time really works! I'll try leaving the stalks on next time to see how it works. Entering the entertainment itself is considered to be very convenient and easy to access.